You can make your nachos extra special like Mitzi’ does by making her own specially spiced refried beans. Mitzi entered our first Super Bowl recipe contest and we wanted to share her recipe with you. Nachos are wonderful, you can add all sorts of toppings to these nachos, guacamole, sour cream, peppers, olives, well you get the idea. 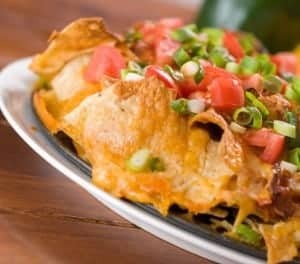 Enjoy these nachos, they are perfect for watching the big game. Preheat oven to 400 degrees and cover a cookie sheet with either foil, or spray with non-stick cooking spray. Cover the bottom of the cookie sheet with tortilla chips. Mix together the beans and 1 tablespoon of juice that comes out of a jar of jalapenos. Drop spoonfuls of the refried beans over the tortilla chips as evenly as possible. Drop spoonfuls of the chili over the tortilla chips. Cover with cheese, and bake for 15 minutes or until the cheese is melted and bubbly. Top with salsa, black olives, jalapeno slices, sour cream, or anything else you can think of! I put my beans in a zip lock cutting the corner of the bag and squeezed the beans evenly over the tortilla chips. Made it a lot easier.